AMTA members save 40% on all online CE courses. Learn more about joining AMTA. 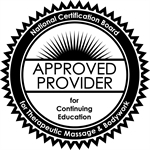 Rest assured knowing AMTA courses are rigorously vetted, NCBTMB-approved and submitted for state continuing education.